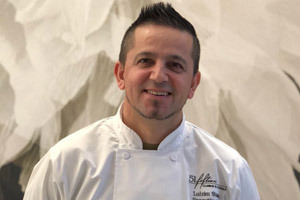 Executive Chef Luigi Shimaj attended the Le Cordon Bleu Culinary Institute in Florence, Italy, graduating with a diploma of Classic Italian Alto Cuisine. His experience in the culinary industry includes cooking in top restaurants throughout Italy and Houston for nearly 20 years. Chef Shimaj’s culinary ambitions were developed at young age. His mother’s cooking and his immersion in Italian culture impacted his culinary point of view, to the extent that the flavors of his mother’s dishes and Italian ristorantes and trattorias can be tasted throughout his menu. Focusing on medleys of fresh seafood, meat and pasta, seasonal and local ingredients, Chef Shimaj is inspired to recreate the tastes of Italy for the diners of 51fifteen. His vision is to create enticing specials in addition to 51fifteen’s menu staples that guests have come to enjoy. Dish presentation will also be elevated, captivating guests before they take their first bite.